We spend ⅓ of our lives sleeping meaning that choosing a comfortable, quality mattress is a decision that greatly affects your life. The better your mattress quality, the better your sleep quality, meaning the greater overall energy you will have on the day-to-day. With this in mind, the DreamCloud mattress has been carefully constructed with only the best quality materials and unbeatable design. We understand just how important a good night of sleep is for your overall wellbeing and happiness. Below we have outlined the best parts about the DreamCloud mattress in comparison to Sleep Number’s i8 model. Disclosure: We pay a commission to the review sites listed below when visitors click on a Nectar affiliate link on their sites and make a purchase. DreamCloud’s 8 layer construction and luxury materials are lovingly crafted to cradle every inch of your body and lull you into a deep, restful sleep. 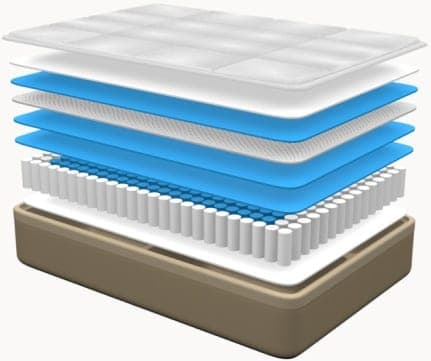 Many mattresses on the market stick to one type of material, but DreamCloud breaks the mold with our utilization of 5-zone, patent-pending “BestRest” foam-encased coils and top quality memory and gel foam. By using both foam and coils, DreamCloud’s hybrid design meets perfectly on the corner of comfort and support. Keeping in mind your ultimate comfort and satisfaction, DreamCloud uses only the highest quality, most luxurious materials when crafting our mattress. We want you to feel like royalty every night. Our Cashmere blend cover and hand-tufted Eurotop provide extra cloud-like cushion and softness that cradle your back and spine. Our unique layers of memory foam include gel in order for you to remain temperature neutral, natural latex in order for an extra cushioning bounce, and layers of high density foam to ensure support where it’s needed. The Sleep Number i8 does not have the same mixture of BestRest coils and memory foam as DreamCloud. The Sleep Number i8 is made with either one or two air chambers, depending on the size bed you get, and they deflate or inflate depending on your preferred sleep number setting and firmness/softness preference. Though constructed with multiple foam layers along with air chambers that have adjustable firmness, the Sleep Number i8 comes with a high price tag ($2,999 for a queen) but does not offer the same luxurious quality materials as a DreamCloud mattress. When it comes to luxurious feel at an affordable price, DreamCloud is the right choice. A True Tufted Cashmere Blend EuroTop: Unbelievably breathable and soft, this top layer looks and feel like a dreamy cloud. Gel-Infused Memory Foam: This layer keeps your temperature neutral throughout the night while contouring perfectly to your body keeping you snug and your spine supported. Super Soft Quilted Memory Foam: Completely unique to the DreamCloud experience, this layer was crafted with lullabies in mind. Supreme Natural Latex: This natural latex layer provides an extra cushioning bounce for some extra give and additional contouring. “Dream Plush” Supporting Memory Foam: Provides deep, luxurious support transporting you directly to dreamworld. Super Dense Super Soft Memory Foam: High density memory foam layer that supports you and relieves pressure in any sleep position you prefer. Patent-Pending “BestRest” Coils: A 5-zoned foam encased micro coil compression system unmatched in the field, keeping you supported and comfortable from head to toe. High Density Super Soft Memory Foam: Meticulously crafted, super dense foam that keeps your back aligned and spine cradled while you drift off. Sleep Number i8 only has a 13” profile compared to DreamCloud’s 15”. It’s layers include a base, air chamber(s), 3” PlushFit comfort foam, 2” of Quilting foam, and pillow top. However, if you are looking for ultimate comfort and luxurious quality at an affordable price, it’s DreamCloud everytime. True Tufted Cashmere blend cover EuroTop: DreamCloud’s Cashmere blend cover provides unmatched breathability, premium softness and is naturally resistant to bedbugs. Gel-Infused Memory Foam: Contouring support that conforms to your body, DreamCloud’s gel infused foam is cooling and supportive. Super Soft Quilted Memory Foam: Unique to DreamCloud and developed with lullabies in mind, resting on DreamCloud’s quilted foam is like lying on clouds. Super Dense Memory Foam: DreamCloud’s Super dense foam keeps your back in alignment and cradles your spine no matter what sleep position you prefer. Patent-Pending “BestRest” Coils: A foam encased pocketed micro coil compression system provides unmatched dream support from head to toe. High-Density Super Soft Memory Foam: DreamCloud’s High density foundation foam keeps your back in alignment and cradles you no matter what sleep position you prefer. Supreme Natural Latex: DreamCloud’s hypoallergenic super premium natural latex layer provides a cushioning bounce for extra give and added contouring. “DreamPlush” Supporting Memory Foam: high density memory foam provides deep support. Choosing a mattress is a big decision. At DreamCloud we realize that it isn’t just a monetary investment, it’s also a large investment in the time and effort it takes to decide on a mattress suited for you, coordinating the purchase (do you need to borrow a truck/trailer), and setting everything up. DreamCloud aims to make the lives of our customers easier, which is why we include a Sleep Concierge and White Glove Service with the purchase of every DreamCloud mattress. Our Sleep Concierge is the backbone of our amazing customer service team. They will help you coordinate your in-home trial, answer any questions you have, and make sure the process runs as smoothly as possible for you. In addition to the Sleep Concierge team, we also have our White Glove Service, an optional service that is included in the purchase of a DreamCloud mattress. Our dedicated White Glove Service team will hand deliver your mattress, set it up, remove the packaging, and remove your old mattress at no additional cost to you. Sleep Number i8 does not have a Sleep Concierge or White Glove Service. For around a third of the price of Sleep Number i8, DreamCloud includes a variety of additional services with the purchase of a mattress that all aim to make your life easier. DreamCloud’s 365 day trial period is unmatched in the mattress game and also includes free returns and shipping. You are able to test out the mattress for an entire year at zero risk. We are so confident that you will love our mattress that we want give you the freedom to try it out in every season. If at anytime you decide that it’s not right for you, we will even come pick it up for you. In comparison, Sleep Number i8 offers the industry standard when it comes to trial periods. They will give you a 100 day trial, which is little more than one season to test out the Sleep Number i8. Not only will you spend about three times as much for the Sleep Number i8, but you will not get some of the same incredible benefits that you get with the DreamCloud, including the chance to test it out for an entire year. We want DreamCloud to be the last mattress you ever need to buy. With its 25-year limited warranty, the Sleep Number i8 offers a full coverage period for the first two years, after which the replacement and repair costs are prorated for the remaining warranty term. DreamCloud on the other hand, offers an EverLong warranty, which covers the mattress for the lifetime of the original purchaser. It’s true, our warranty lasts as long as you do. When it comes the the DreamCloud, we know that Goldilocks would be a huge fan due to its “just right” balance of comfort and support. On a scale of 1-10 with 1 being too soft and 10 being too firm, DreamCloud lands at a 6.5. The firmness and support of the Sleep Number i8 depends on a variety of factors. The specific sleep number that you choose determines the amount of air in the mattress and level of firmness you will feel. Before DreamCloud, it was nearly impossible to find another mattress made with 15” of fluffy memory foam comfort. 15” mattresses were only found in stores and through retailers and heavily marked up prices. The Sleep Number’s i8 model is only 13” in its profile and does not have the same amount and quality of memory foam as the DreamCloud. Out of its 8 overall layers, 5 of those are unique memory foam layers. The gel-infused layer of memory foam ensures optimal sleeping temperature as it pulls heat away and disperses it to keep you cool throughout the night. The super soft quilted memory foam layer is unique to the DreamCloud brand and hugs you like a big, fluffy, cloud. The “DreamPlush” layer of supporting memory foam cradles your spine until you drift off into dreamworld. Lastly, the high density super soft memory foam layer ensures that no matter what sleep position you prefer, you will feel comfortable and supported. If you tend to sleep hot, look no further than the top quality moisture wicking cashmere blend cover and gel infused memory foam layer specially designed for the DreamCloud mattress to keep you cool throughout the night. Popular review site, getbestmattress.com, explains that “the most annoying and uncomfortable problem with the memory foam is that it tends to heat up a lot. The heating up is usually what causes a lot of sweating in the night…A memory foam with infused gel effectively eradicates the problem by cooling down the bed and allowing heat to flow through the mattress instead of becoming trapped in the foam.” The Sleep Number i8 does not have the same gel infused memory foam or cashmere blend cover that wicks away moisture to help distribute heat away from the body at night. Sleeping hot is the thing of the past when it comes to sleeping on a luxurious DreamCloud. Low motion transferability is especially important to those who sleep with a partner. If you are any kind of a light sleeper, your sleep may be extremely compromised when on a bed that has a high level of motion transferability – you’ll feel each time your partner rolls around. This is why we have taken this issue into serious consideration when constructing the DreamCloud mattress. Not only did we design a mattress that is so comfortable your body will feel held and supported all night, but motion transfer on the DreamCloud is very low. Mattressclarity.com raves over DreamCloud’s low motion transfer explaining that DreamCloud is a luxury “hybrid mattress [that] features individually pocketed coils, which helps even out weight distribution across the bed but also adds a little spring/bounce. The foam layers on top have a more responsive feel, probably thanks to the spring of the coils and the natural latex layer.” By evening out the weight distribution across the bed and maintaining this spring/bounce with the foam encased coils makes DreamCloud have excellent motion transferability. Motion transferability in the Sleep Number i8 really varies depending on the size and type of i8 model you choose. With a size that contains two separate air chambers, it is easy to adjust according to each sleepers preference. The chambers are almost like two different beds in one. When you have a smaller sized bed however, there is only one air chamber and the motion transferability is much more apparent. One of the best part of the DreamCloud’s dreamy likeness to a plush cloud, is its Eurotop that is hand anchored to a dense foam base using a double tuft stitch hand crafted. The incredible handiwork of the stitching makes the mattress as durable as it is luxurious. Compared to other luxury mattresses in the industry, the brilliant quality of this work is pretty much unheard of at the DreamCloud’s price. As a top-quality luxury hybrid mattress, DreamCloud is also constructed with reliable edge support in mind. Popular review site, mattressclarity.com says that “the edge support is immediately noticeable on the DreamCloud mattress. Part of the reason for this is the nearly 8″ coil system that provides support and the reinforced foam sidewalls around the bed as well.” If you tend to toss and turn at night, not only will you keep your partner happy and asleep with low motion transferability but you don’t have to worry about taking a tumble out of bed because of DreamCloud’s extra reinforced edge support. DreamCloud has taken the mattress industry by storm with leading scores from trusted third-party reviewers. Memoryfoamtalk.com summed it up best: “If you want a luxury hybrid mattress that sleeps cool and is super supportive and comfortable at a price 3-4x less than competing in-store mattresses of the same quality, with a lifetime warranty and 365 night sleep guarantee – the DreamCloud simply cannot be beat.” When deciding between DreamCloud and Sleep Number i8, you won’t regret choosing the Plush Life. Book a 365 night stay on a DreamCloud.